Festivals give a great reason for a little indulgence. One can get a little brave and not think of calories while making sweets at home. Home- made is healthy, home- made is happy. We’ve always had a tradition of making sweets at home during festivities. The atmosphere at home would be charged and spirits high. Amongst high decibels of non-stop chatter, delicacies would be prepared and it would be a complete team work. 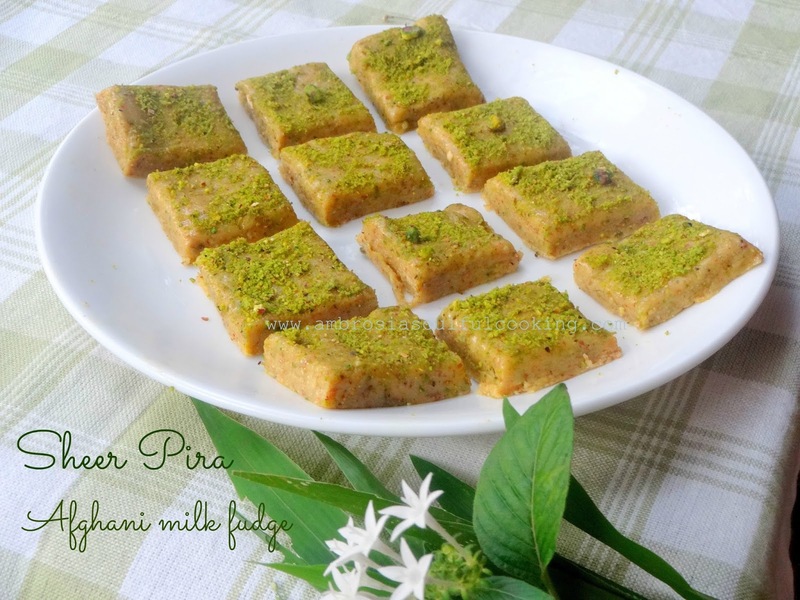 Keeping the same beautiful trend going, we made a delicious Afghani sweet – Sheer Pira. Sheer Pira is a melt in the mouth, juicy and delicious milk fudge. It is easy to prepare and is a very healthy dessert. It has a great texture and robust flavours of rose water and cardamom that make it delectable. It is chewy and a very addictive sweet. It is low on calories. Powder walnuts and almonds in a food processor. 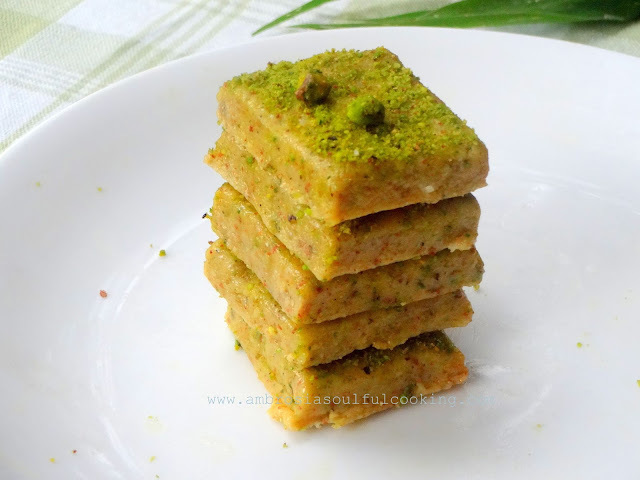 In a deep bowl, take milk powder, powdered walnuts, almonds, and cardamom. Stir to mix well. Take a plate and grease it generously with butter. In a steel wok, take water. Add sugar. Bring it to a boil. Keep stirring and let the syrup come to a rolling boil. Take a drop in a plate and test it between index finger and thumb for one string consistency. Turn off the heat. Add rose water. Stir. Add milk powder, powdered nuts and cardamom. Stir to mix well so that the mixture becomes smooth and shiny. Empty the mixture into the greased plate. Tilt the plate so that it spread uniformly. 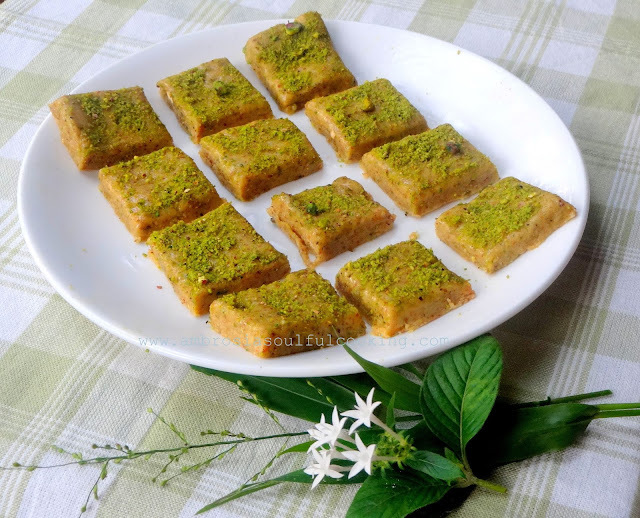 Dust with powdered pistachios. Press with your hands so that pistachios set into the mixture. Keep in a dry place for 45 minutes to 1 hour till cold. With a sharp knife cut squares.